The Peggy Lee Hahn Garden Pavilion is buzzing with big, colorful bee images by Deana B Marion until August 28th at 10 a.m. 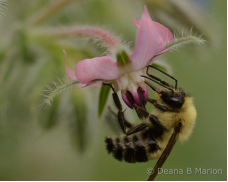 The show debuts Deana B’s macro photos and features close-up images of honey bees, bumble bees, and friends in their natural environment on a variety of seasonal blooms. If you haven’t seen it yet please make the opportunity to go, the pictures are fantastic say Richard Reid, NRVBA President and Sue Hossack, NRVBA Secretary. The Hahn Horticulture Garden is located at 200 Garden Lane (off Washington Street) – Virginia Tech – Blacksburg, VA. Visitors are welcome to view the displays in the Peggy Lee Hahn Garden Pavilion Gallery from 8:30 a.m. to 4:30 p.m., Monday through Friday (with the exception of Wednesday, August 26th from 11 – 1 and Thursday, August 27th from 4 – 4:30). You may want to call ahead to confirm there is not a private event in the Pavilion that day. Be sure to pick up a Visitor’s Permit from Parking Services or the VT Visitor’s Center. F/S spaces are for faculty and staff only. This entry was posted in beekeeper education, NRVBA, Products & services, special events. Bookmark the permalink.